All leg lengths are approximate, measured by vehicle odometer only. All finishes are on the left side of the road. Run on the left side of the road ONLY and as close to the shoulder as possible. Pull off on the shoulder to allow for oncoming traffic when necessary. Runners are NOT permitted to accept water, or other refreshments, along the route from anyone except those assigned by the event organizers at authorized aid stations. When parking anywhere along the event route, if you cannot get ALL FOUR WHEELS OFF THE ASPHALT, move on to a location where this can be accomplished. Please limit the number of vehicles that accompany your team. The more vehicles your team has, the fewer the parking spaces that will be available for others. Congregate at the Prospect Road Community Centre parking lot at 2141 Prospect Road (Route 333). Proceed east along Prospect Road, past Exhibition Park to the intersection of Route 333 and Highway 3. Turn left onto Highway 3 and continue west, past Bayers Lake Industrial Park, through Beechville, finishing at the Community Centre in Lakeside. This leg has short rolling hills throughout. It will be dark for the start of the leg (reflective vests must be worn by all runners, but it will be daylight by the time the runners reach the finish line. Note: This is a residential area, so please keep the noise down! WARNING: Any participant caught relieving themselves outdoors at the start will be suspended from the relay. Parking: There is plenty of parking at the Prospect Road Community Centre, but parking is limited at the Lakeside Community Centre. All others must park in other available parking areas or along the roadway with ALL FOUR WHEELS OFF THE ASPHALT. Do not block driveways. Water stations: 2. Teams looking after these stops can pick up their supplies from the back of the registration van (the one with the green flashing light) any time after 5:30 am. Food & Facilities: There is a Tim Horton’s at the intersection of the #3, the #101 and Bayer’s Lake. There is a Green Gables on the right just prior to the Leg #1 finish line. There are port-a-potties at the finish line. Note: The team captains’ meeting will be held at the end of Leg 1 at 7:30. Water will be given out to the teams who will be doing the water stops on Legs 2 through 10. Teams can also collect their T-shirts at the end of Leg 1. Start at Lakeside Community Centre and run west along Highway 3 through Timberlea to finish up a driveway on the left side of the road at the Sheldrake Lake Metro transit terminal. This leg is both flat and short, and considered one of the easiest on the course. Food & Facilities: There is a Tim Horton’s and a gas station 1.5K into this leg. There are also a few convenience stores along the way. There are port-a-potties at the finish line. 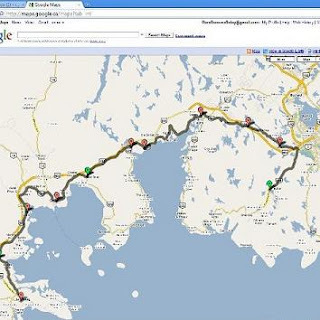 NOTE -- runners will take in a short section of the St. Margaret’s Bay Rail Trail in Tantallon. Beginning at the Sheldrake Lake Metro Transit terminal, this leg continues west along Highway 3 through Sheldrake Lake, Five Islands Lake, Lewis Lake, and finishes at the former fire hall at the Head of Saint Margaret's. Parking: There is some parking at the fire hall, but once the finish chute is set up, the lot is closed. There is some parking across the street at the garage; otherwise vehicles must park along the roadway with ALL FOUR WHEELS OFF THE ASPHALT. Do not block driveways. Food & Facilities: There is a convenience store along the way plus a gas station and food bar at the 9.5K mark (Hammonds Plains turn-off). There are port-a-potties at the finish line. Start at the Fire Hall at Head St. Margaret's and run downhill to the coast. Follow Highway #3 and the coast for most of this very scenic leg until the finish at Queensland Beach. The finish is by the beach on a side road to the left. While the longest on the route, this leg is mostly gently rolling hills. It is considered difficult only because of its length. Parking Available beyond the finish line in the Queensland Beach parking lot. If vehicles are parked along the roadway they must have ALL FOUR WHEELS OFF THE ASPHALT. Food & Facilities: There are a few convenience stores along the way. Public toilets and change rooms are available at Queensland Beach. NEW FOR 2018 : The start line is at the end of the finish chute, near the pit toilets. You'll run west along Conrad Road until it meets St. Margaret's Bay Road. Turn left and follow St. Margaret's Bay Road until directed to turn left onto Yacht Club Road. The finish is at the bottom of the hill. Parking: There is now parking available at the end of leg 5. Vehicles will be allowed in when there are no runners on the approach to the finish chute. If you park in the finish area, you will not be allowed to leave the parking lot until 10 minutes after the finish line has left the area. Otherwise, vehicles parked along the roadway must have ALL FOUR WHEELS OFF THE ASPHALT. Do not block driveways. Food & Facilities: The Trellis Café is located on the right approximately 500 m past the end of this leg. There is often a food truck and/or a flea market across the street from the Trellis. There are no washroom facilities at the finish line, but if you go down the road to the tourism information centre, you'll find washrooms there. Start at the Hubbards Yacht Club and run up the hill to Highway #3. Turn left and proceed west along Highway #3. Finish in the Louisiana Pacific Canada Limited boxboard plant parking lot, just before the turnoff to Blanford at East Chester. Lots of rolling hills on this leg. The last kilometre is a gentle, and soothing, downhill. Parking: There is some parking at the boxboard plant. Remember that the plant is in full operation and that you cannot in any way restrict access of working vehicles to the plant. Otherwise, vehicles must park along the roadway with ALL FOUR WHEELS OFF THE ASPHALT. Do not block driveways. Food & Facilities: There is a gas station and small mall on the right approximately 1K into this leg. There are port-a-potties at the finish line. Start at the Louisiana Pacific Canada Limited plant parking lot. Proceed west along Highway #3. There are a number of large uphills and downhills between here and Chester. Turn left at the intersection in Chester (at the Esso station just past Tim Horton’s) and finish (sharp left) up the Chester Area Middle School driveway which is located a short distance beyond the intersection. Parking: Limited parking is available in the school parking lot. Do not park at the Save Easy! Otherwise, vehicles must park along the roadway with ALL FOUR WHEELS OFF THE ASPHALT. Food & Facilities: Look for antique shops along the way. There is a grocery store across the road from the finish line. There are also numerous shops in the Village of Chester. There’s the Tim Hortons, a Subway and a diner just prior to the finish line, and just past Pig Loop Road. There may be washroom facilities available at the finish line (if the school is open). Start on the road below Chester Area Middle School driveway. You’ll run east, then turn sharply left back onto Highway 3 (running around the grocery store). There will be rolling hills and one large hill in the first half of this leg. Once you cross the Gold River Bridge it’s very flat, and scenic, to the finish at the Western Shore Municipal Wharf (next to Memorial Hall and across from the Fire Hall). Parking: Parking is SEVERELY limited. Vehicles parked along the roadway must have ALL FOUR WHEELS OFF THE ASPHALT. Do not block the fire hall access. This would be an appropriate time to arrange carpooling for dropping off and picking up your runners. It would be to your advantage to move your team vehicles to the end of Leg 9 or even to Lunenburg. Do not block driveways. Food & Facilities: The Chester Shore Mall is located on the left approximately 1K into this leg. There are a few convenience stores as well as gift and antique shops along the way. There are public washrooms about 200 meters from the finish line. The fire department has a fish fry and bake sale and they very generously let us use their washrooms. Buy fish, run faster! Leave the Western Shore Municipal Wharf and continue along Highway 3 through Martins River to finish at the Municipal Wharf on the Lunenburg side of Mahone Bay. This leg has a number of flat stretches along with a number of long gradual uphills. There is a long downhill leading into Mahone Bay and past the three churches. Proceed past the churches turning left (toward Lunenburg) at the war memorial monument in the center of town. Follow along the waterfront to the finish line at the Mahone Bay Municipal Wharf. Parking: Teams are encouraged to send only one vehicle into Mahone Bay. Extremely limited parking is available on the Government Wharf. On-street parking is extremely limited. Park on side streets approaching the wharf, rather than on the road past the wharf. If the Scarecrow Festival is on, count on parking being non-existent. Please obey no-parking signs and directives of the road marshals. Do not block driveways. When you leave Mahone Bay, take Fauxburg Road to avoid traffic congestion. Food & Facilities: There are several convenience stores in Western Shore just past the start line. There are numerous facilities in Mahone Bay, including a new Tim Horton’s in the Irving Mainway. Check the tourist bureau, just prior to the three churches, for information on the Scarecrow Festival, held the following weekend, and sometimes the same weekend. There are public washrooms at the finish line. Start at the Municipal Wharf on the Lunenburg side of Mahone Bay and follow Highway 3 as it winds along Mahone Bay Harbour. The course is basically flat as it follows the coast, then gets hilly with some long flat sections when you turn inland. As you approach Lunenburg you will turn left at a major intersection. Take the first right past the intersection and continue into the town. You will wind through the town to finish at Bluenose Academy, 18 Tannery Road. Course marshals will be placed along the way to guide you. Parking: Parking is available in the Lunenburg Community Centre’s parking lot. Do not block the finish chute. On-street parking on the streets surrounding the Community Centre/Bluenose Academy is available. Please obey posted parking signs. Food & Facilities: Numerous facilities (restaurants, inns, pubs) in Lunenburg. There are washroom facilities at the finish line but NO SHOWERS. A light supper is provided at the awards ceremony.